A new report published in April 2014 by the School Choice Demonstration Project by the University of Arkansas's Department of Education Reform reveals continued inequality in funding for charter schools persists across the country. The researchers "identified a funding gap of 28.4 percent, meaning that the average public charter school student in the U.S. is receiving $3,814 less in funding than the average traditional public school student. Since the average charter school enrolls 400 students, the average public charter school in the U.S. received $1,525,600 less in per-pupil funding in 2010-11 than it would have received if it had been a traditional public school. The gap is actually higher in focus areas within states where charter schools are more commonly found, such as major cities." 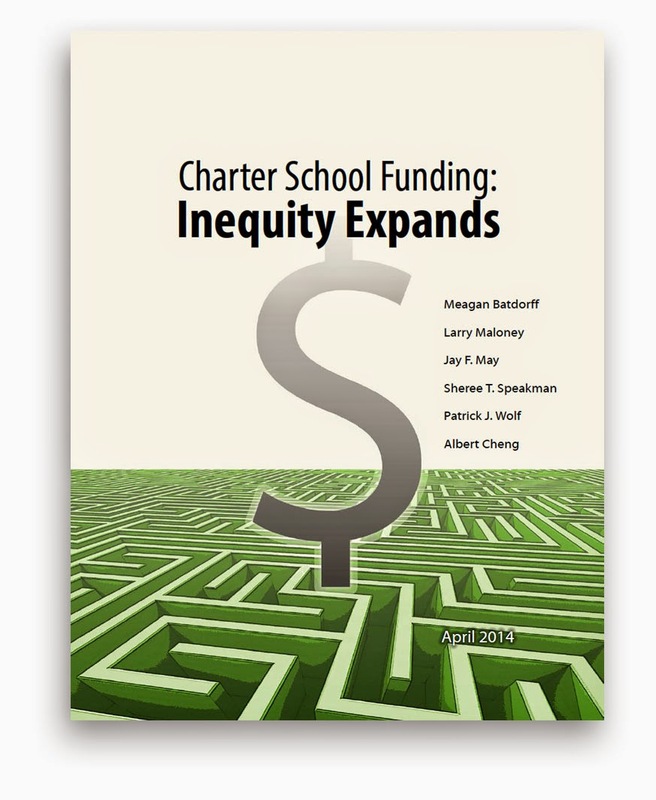 Magnitude of Disparity: If, in aggregate, districts in the 30 states and D.C. received the same level of per pupil funding as charter schools in FY11, they would have received $110,860,725,324 less in total revenues. The loss in revenues to a single charter school is enormous. For a charter school enrolling 400 students in FY11, the school received $1,525,600 (weighted) less on average than would have been the case if funding were equalized between district and charter schools. In FY11 districts received $3,509 more per pupil than charter schools, a 54.5% increase since FY03 (inflation- adjusted). The funding gap has increased significantly since FY03 while charter enrollment has increased in every state and in Washington, D.C., in the same period. District enrollment has decreased in D.C. and in 16 of the 24 states included in this study since FY03 (Methods used for weighted calculations are found in the Appendix). During the FY07 to FY11 period, total funding declined for districts in seven states, while total funding declined for charter schools in 14 states. By FY11, charter schools nationwide lost $555 per pupil from the total funds received in FY07 ($9,419), while school districts gained $233 per pupil from their total FY07 funding ($11,389). Click here to download and read the entire or state-by-state report.